First Nerve: SWI: Wilting of the April Bloom? 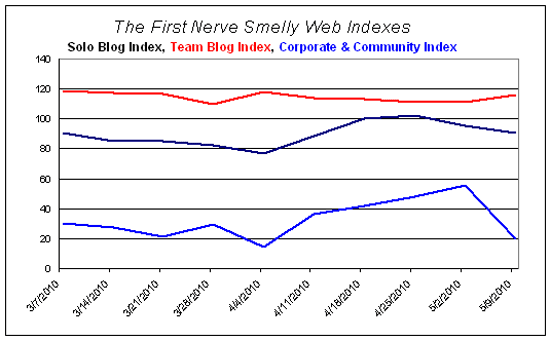 The Corporate & Community Site Index plunged 36 points to its second lowest all-time level, led by a precipitous drop at TheDryDown. Sniffapalooza gave back some of last week’s big gain. Is it over-reading the tea leaves to note that the CCSI’s rise and fall coincides with the launch-happy, Spring Fling month of April? 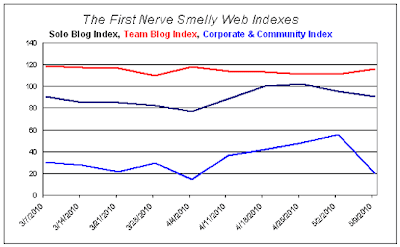 The Solo Blog Index slid another five points after dropping seven last week. Vetivresse was up big time for no discernible reason; no new content since January 20. A month-long posting gap in March/April may be behind the continuing slide at IndiePerfumes. BoisDeJasmin, KatiePuckrikSmells and FirstNerve all registered double-digit declines. The Team Blog Index continued its long-term steady-as-she-goes trend with a five point gain that took back three weeks of tiny declines.